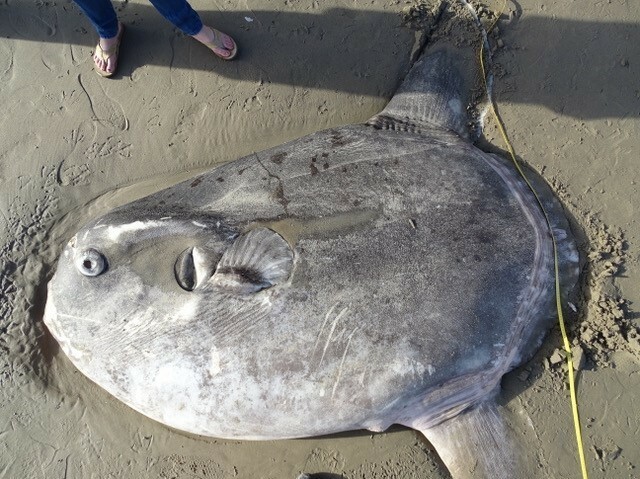 The animal, identified as a hoodwinker sunfish, washed up on a shore last week at UC Santa Barbara's Coal Oil Point Reserve. "I literally nearly fell off my chair," Marianne Nyegaard of Murdoch University in Australia said in a statement. Nyegaard, a sunfish expert, discovered and described the Mola tecta sunfish — commonly known as the hoodwinker sunfish — in 2017. The more common Mola mola ocean sunfish is known to swim in the Santa Barbara Channel. The hoodwinker has only been found in the Southern Hemisphere, aside from just one known example that washed up in the Netherlands in 1889. Thomas Turner, an evolutionary biologist at the University of California, Santa Barbara, heard from a colleague last week about what they thought was a dead Mola mola that had washed up at UCSB's Coal Oil Point Reserve. 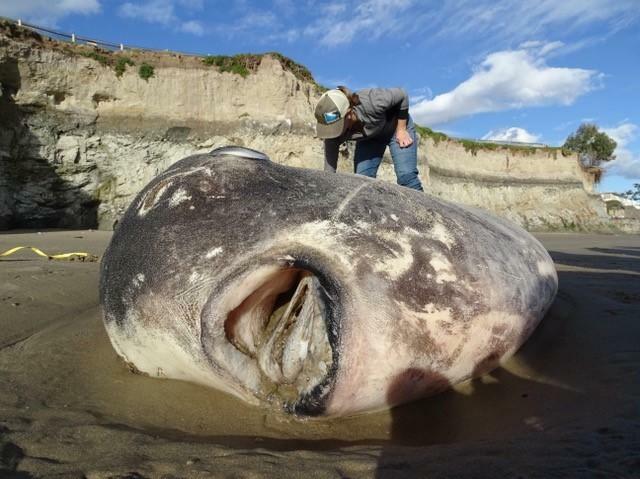 "I went down there with my family, my young 4-year-old son and my wife, as soon as I got off work to just check it out because I wanted him to get to see a Mola mola up close," Turner told NPR. Turner, shown here with his young son, says the animal measures some 7 feet long. He uploaded photos of the animal onto a website called iNaturalist — a site where scientists and amateurs alike can post photos of plants and animals they observe to help researchers track where species live. "It's the strangest fish I've ever seen," he says. The creature is huge, he adds, but "they're basically shaped like a disc. So they're flat, and they've lost their tail, completely, and they just have sharp fins that stick up off the top and the bottom that they use to flap kind of like a bird's wings." Their faces have a "permanently surprised expression," he says. They dive deep into the open ocean to feed, then pop up onto the surface to bask in the sun. Ralph Foster, a fish expert at the South Australian Museum, saw Turner's post on iNaturalist and said he was puzzled. "To me it looks like M. tecta," he wrote. "It'd be quite a turn up for the books if it really is M. tecta, I think." He flagged the post for Nyegaard, the scientist who discovered the hoodwinker. She replied that it "does superficially look a lot like Mola tecta," though she needed a closer look at parts of the fish to figure out what it was. "After Marianne and Ralph saw my photos, they got quite excited but were hesitant to say it's a hoodwinker because as far as we know it doesn't appear anywhere nearby, never been reported in the Americas," Turner said. 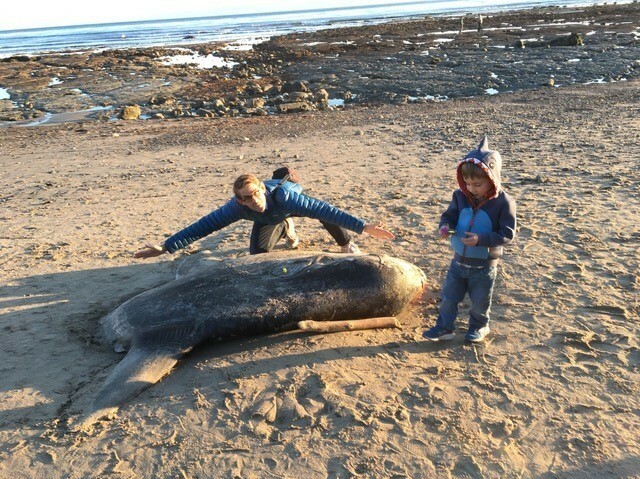 He and his colleague Jessica Nielsen returned to the beach to try to find the fish again, and found it washed up a few hundred yards down the beach. They took photos and collected tissue samples, and a UCSB scientist dissected the dead animal. The species was recently discovered by Marianne Nyegaard, a scientist at Murdoch University in Australia. Nyegaard's response was immediate: "HOLY MOLA!!!" It was definitely a hoodwinker. While neither type has a tail, she could see that this animal still has a "back-fold," leaving a flap-like structure, which is absent in the common type. The two species also have different types of scales. "Eyes and ears and hands on the ground half a world away — wow," Nyegaard said in the UCSB statement. She's going to test the tissue samples, Turner says, to see how closely it's related to examples of the species found in Australia. "It's possible we don't really understand the range of this fish as well as we think because she so recently discovered it, or it's possible that they just occasionally range very far out of their usual space," he said. Turner's work typically focuses on invertebrates like insects. "I'm not a fish expert," he says. "What's really great about this story is that anyone could have made the same discovery by posting on this site."